I am very pleased to have created an installation of the greatest milestones of my career – watercolours on a Grand Scale – in the huge showroom at Summers Place. The installation can be seen over the weekend of the 17th-19th May at Summers Place Auctions, Billingshurst, West Sussex, UK alongside the viewing for Summer Place Auction of Sculpture and Design. Some of these works were exhibited & sold in New York, others were commissioned privately by enlightened patrons and have never been seen publicly before. Some may be familiar to you as previous Paintings of the Month. To make this show possible I have pioneered a method of creating facsimiles of these paintings on thick watercolour paper, life-size images which are being displayed exactly as they would appear in the studio, naked and frameless, powerful subjects suspended in space. They make a startling collection. 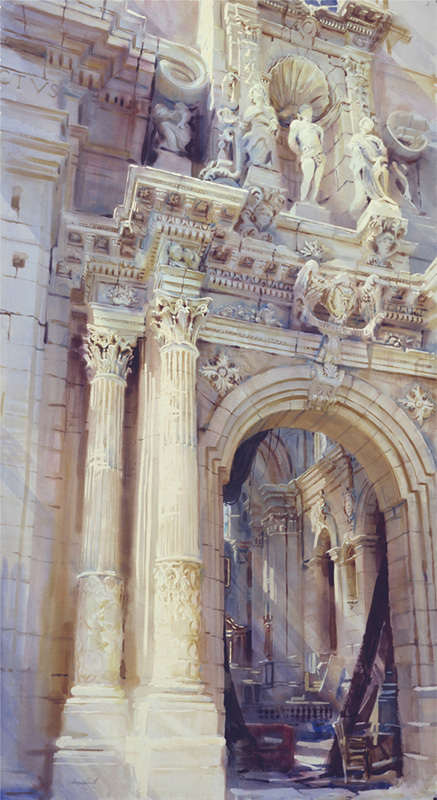 As the centrepiece of the show there is one special original watercolour depicting the facade of a crumbling church in Sicily. This large piece—without doubt one of my most successful—was sold to Ireland in 2007 and I never saw it again. Until last week when it became part of my collection once again. I’ve missed it and I’m proud to be able to show it oncemore. Those that know Sicily will be familiar with its wonderful architecture, but few will know the charming facade of San Sebastiano in Ferla. A little village hidden in the hills behind Siracusa, Ferla doesn’t even get a mention in most guide books. It has no less than four notable churches – modest, diminutive and charming. All carried the scars of earthquake and neglect, two have been restored but the largest—San Sebastiano—is boarded up, cracked and abandoned. It became my favourite subject, my friend, and I revisit it each time I return to Sicily. I am always apprehensive in my approach lest one day it will be gone, crumbled away in the hot sun. I have painted here several times, always in late morning as the early sun moves off the eastern facade, the shadows lengthening, animating the details. St Sebastian himself poses in a languid ecstasy in his niche with the last of the sun tickling his torso. He is flanked by female guardians and the contorted forms of Moorish slaves who are supporting giant volutes. The door itself is surmounted by a lavish noble eagle—subsequently decapitated by fate—representing, no doubt, the patron who enabled this lavish and surprisingly refined facade. In the frieze putti are seen dragging cornucopias of fruit behind them, while above the columns the masks of two angels are shown kissing. Such was the appeal of Heaven in this harsh and unpredictable landscape! The whole ensemble is charming and unexpected in this remote spot. I return day after day at the same time to see the light recede, to sit in the small square in front of the church drawing the details, my pencil caressing the forms and the sunlight nourishing the soul. The church is boarded up, its interior is unsafe. I have never seen inside, but in my mind and on paper I have forced open the doors and depicted an interior of my own making: a heavy curtain is drawn aside to reveal a scene of gentle dilapidation, a Mannerist style of architecture of my own design, from a period earlier than the facade might suggest. In this space I have imagined broken pews, baulks of fallen timber and traces of gilding on the altar, all lit by fingers of sunlight piercing the broken roof. In this way, with pencil and paint one can possess beauty, smuggle it home in a sketchbook, and recreate it as one’s own. It’s a form of artistic Elginism! I have invented what I was prevented from seeing in reality and in so doing have created a place which is mine, inspired by but not tied to actuality and truth. We would love you to see the show at Summers Place 17th – 19th, 10 – 4pm.